When high school basketball star Chelsea Keyes injures her hip during senior year, everything changes. Unable to play the game, she's forced to watch from the sidelines as a promising season goes sour. As if that isn't bad enough, she feels like she's been benched from her life - she can't bring herself to so much as look at a basketball, her dad barely talks to her anymore, and her brother won't get off her case. No one seems to understand just how much she's lost. To help them all reconnect, Chelsea's dad books a three-week family vacation at a lake resort in Minnesota. Chelsea's shocked when she finds out he's signed her up for a boot camp to help her regain some of the strength she's lost since her accident. She's even more shocked when she sees her instructor - 19-year-old Clint Morgan is hot in a way that almost makes Chelsea forget she's got the perfect boyfriend back home in Missouri. Almost. Only the more time she spends with Clint, the more she wonders about Gabe, the guy she's been going out with since junior year. How is it that she feels so much more understood by a guy she barely knows than by the one who should actually know her best? And does her summer fling matter enough to risk the good thing she's got going with Gabe? As Chelsea battles to rediscover herself, her passions, and her strength, she has to decide what really matters to her. And who. Before she ends up losing everything, not to mention everyone, she cares about. Holly Schindler's debut novel, A Blue So Dark, blew me away with its heart-wrenching intensity. Playing Hurt, her sophomore effort, didn't hit me quite as strongly, probably because it's a simpler, more familiar story. An enjoyable story, for sure, just quieter and more predictable. Whatever the tone of her books, though, it's Schindler's bright prose that draws me into them. Her skillful word-weaving brings her stories to such vivid life that I have no trouble believing in them. None at all. Playing Hurt may not have the originality of A Blue So Dark, but it's got the same kind of heart. Which makes it a more-than-worthwhile novel in its own right. 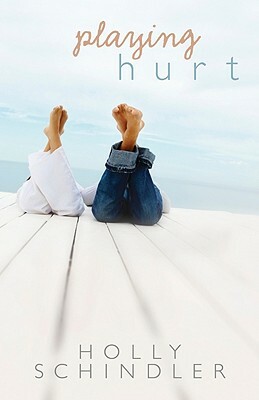 To the FTC, with love: I received a finished copy of Playing Hurt from the author. Thanks, Holly! I've never heard of her, but she sounds like my kind of author.